Check out today's pricing and retail availability for F. Stephen Millier Angel's Reserve Zinfandel. 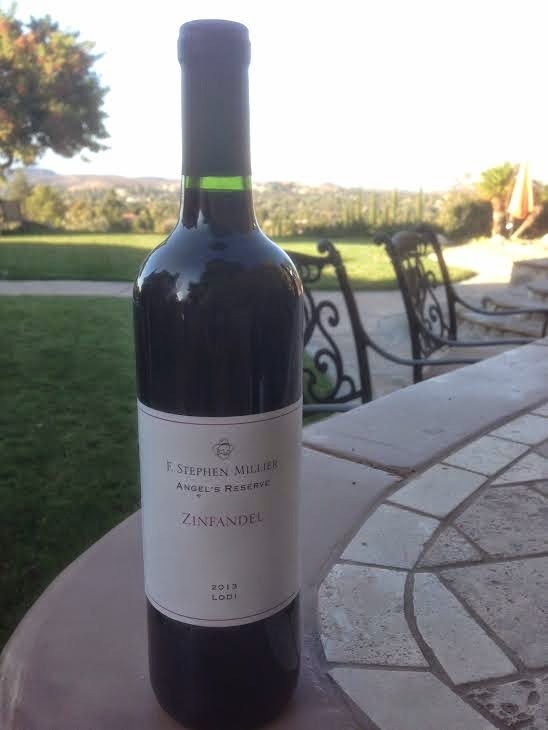 Original tasting and review : This is F. Stephen Millier Angel's Reserve Zinfandel, Lodi, California, 2013, finished at 14.5% alcohol and first sampled one year from vintage date, in October, 2014. In the glass: Medium red. On the nose: Poured at room temperature and swirled vigorously, shows shy, deep fruit, underlying spices. From the aroma, seems like this will be big but still subtle. On the palate: The primary elements on the palate are in fact much as anticipated: subtle at the first sip, with a round mouth of dry fruit entering your palate, but then resolving into spices and dry, big blackberries. In summary: Overall, rates three stars on the five-star Spirit of Wine scale, and is a best value at its bargain price point. Updated review, a month or so later, carries the subtlety, but brings along bold, big, furry fruit, definitely deserving of a plus.